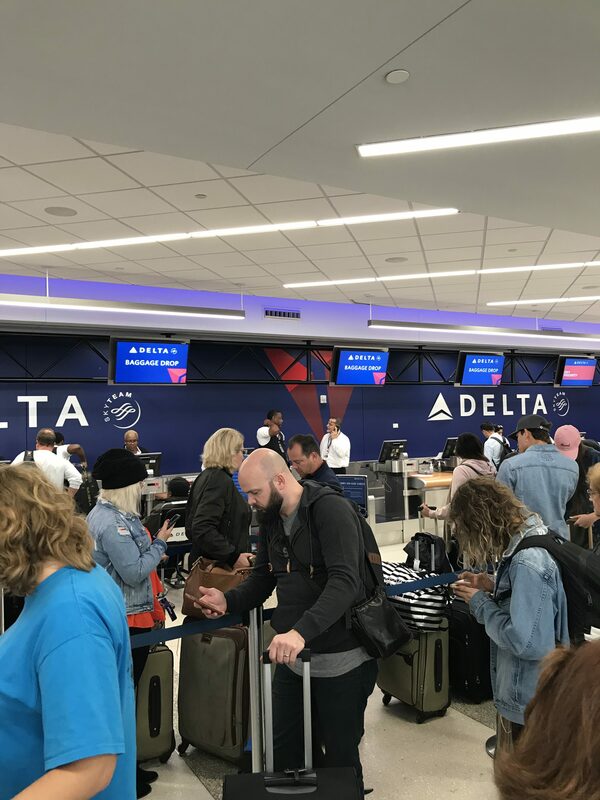 "the worst airport to travel to"
✅ Trip Verified | I travel weekly for work all over the country and for the last 10 weeks, I’ve traveled to Atlanta. ATL is hands down the worst airport to travel to. The majority of the people who work at the airport are bitter, rude and ready to take it out on you. It’s a huge airport and they don’t really think AC is necessary. Especially when they heard you into crowded stalls for TSA. Every flight in and out is delayed. I’m not the only one - ATL is a legend in the field. Avoid it at all costs they say. Wish I could! "Staff surly, unfriendly and unhelpful"
Not Verified | Never ever going to this airport again. Staff surly, unfriendly and unhelpful. Massive lines at immigration, for foreign and US citizens, took 1 hour 50 minutes to get through. Has about 14 booths each side, and only 2 or 3 open at any one time, and the staff walk the slowest I have seen. Missed our connection due to this, asked about moving ahead, no, was reply each time! 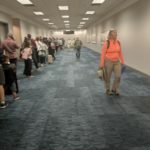 "never connect in ATL again"
Not Verified | Arrived ATL 9 April 2019 from Rome to clear Customs and connect to Fayetteville NC. On arrival at 5:15 pm the terminal was crowded already and there was no movement in the line at all for about 30 minutes, there didn't seem to be any officials working at all but could not verify this because of size of crowd. Line moved very slowly and as planes kept arriving crowd grew. Personnel controlling crowd did not offer clear guidance and could not be heard. I cleared Customs at 7:15, 2 hours later. 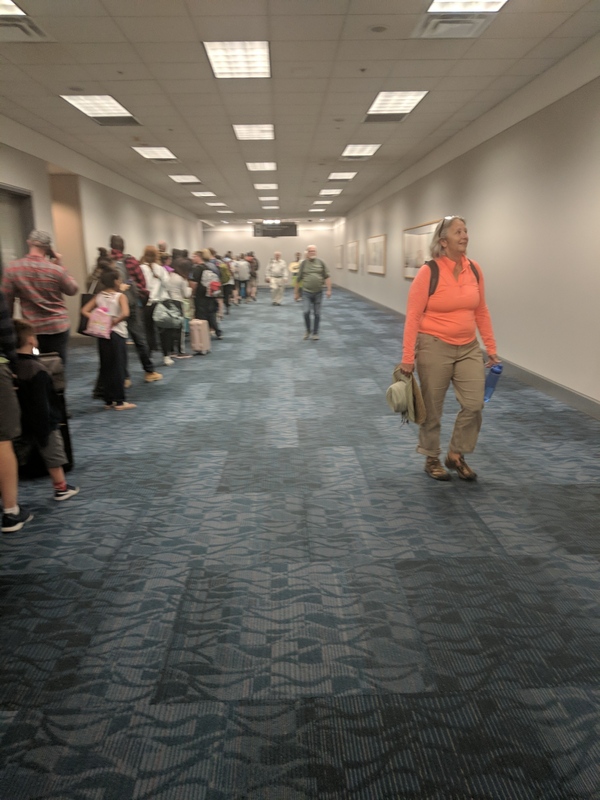 then TSA had to be cleared - take off shoes, etc, pick up luggage and reroute, then a mad dash to connecting flight. Why was this day worse than during other international flights. I will never connect in ATL again even for domestic flights. 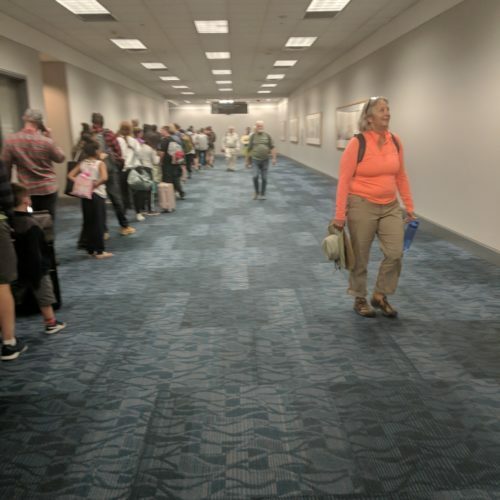 "staff were extremely rude and unclear"
✅ Trip Verified | Customs has one line for all arrivals, nothing separate for connecting flights. The line went for more than .25 miles. The wait time didn't allow enough time for most connecting flights. Airport staff were extremely rude and unclear when asking for help or clarification. 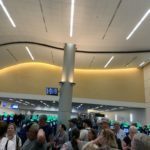 ✅ Trip Verified | Arrived in Atlanta airport on March 24th 6:15 pm to extensive lines to get through Customs/Immigration. We along with hundreds of other passengers waited over 2 hours to get to Customs agent, no kiosks were in use. We and many others missed our connections, our flight was at 8:30 pm, so plenty of time. We could not get a flight out until the following morning, had to get a hotel room and lost work time on Monday. This experience was an unbelievable embarrassment to the US. We have traveled out of the country many times and have never experienced such a lack of service, caring and unprofessionalism. From the other reviews here it is evident that this is commonplace in Atlanta. When given a choice we will not come through Atlanta again. Atlanta airport and US Customs displayed a very unfriendly and disappointing reflection on our country. Sad to know that this is an entry way to our country and the 1st impression visitors will encounter. "everyone around us missed their connecting flights"
Not Verified | March 26th 2019 we were arriving at Atlanta from Mexico. Customs was a mess! The lines went back and forth around the agents desks and then went down 4 or 5 more hallways. Literally everyone around us missed their connecting flights, including us. Staff were miserable and rude and didn’t care one bit or try to help in any way. One giggled when I told her that we had been in line for 1.5hr so far and only had 20 minutes before our plane was taking off. Her exact words were “well you are going to miss” and she walked away. Won’t be scheduling any layovers in Atlanta again. 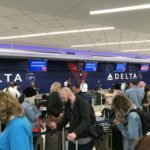 Delta did exchange new flights for the next morning and a room for the night at no charge. Not Verified | Absolutely the worst customer service and attitude of staff that I have ever experienced. Staff did not seem knowledgeable in any way. They snatched tickets from peoples hands, they did not make eye contact and were rude all the way through the process. One particular security lady was a perfect example of how rude this airport's staff is. Without provocation she starts getting at me about the smallest things and being condensing beyond what I have ever experienced in my life and continued to verbally abuse me until I went through the scanner. I have never met such people in my life who made me regret coming back to the USA from Europe. Who wants to be welcomed by these people. ✅ Trip Verified | I am a US citizen returning to the states from a vacation in Amsterdam. We arrived in Atlanta to go thru passport/immigration control. There are about 20 passport scanners but only two were being utilized. Everyone had to go thru extremely long lines to get to a counter with a person, of which there were maybe 7, with hundreds of people in line. Employees shouting at us to go in this direction only to have another employee say the opposite when we get there. Bickering between airport employees, no clear signs about where to go. Not sure I understand the need to go thru airport security again after an international flight. This was the worst run airport for passport control I have ever seen. It was embarrassing for the US, especially when traveling overseas and see how European airports are managed. This can be so much better but no one seems to care unless they are the ones that have to go thru it. I will try to avoid the Atlanta airport when I am traveling international. Not worth the headache. 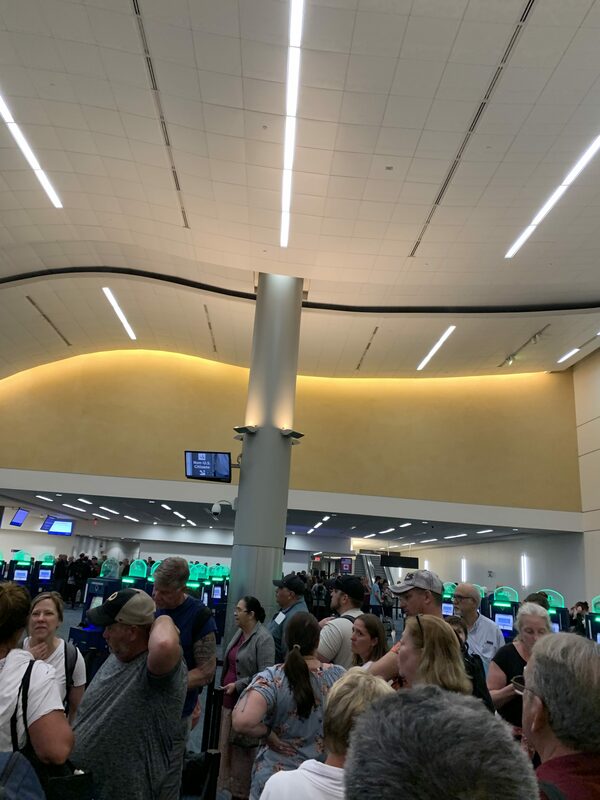 "10 kiosks and 2 were operational"
Not Verified | We arrived from St. Maarten, 3/24/19 at 7pm. It took 15-20 minutes to go through Global Entry. There were 10 kiosks and 2 were operational. People were using the kiosk that did not have GE, tying up the line and being rejected. Since we had a long lay over we waited for our family members to pick up their bags. It took them 2 hours and 15 minutes to get through customs. As we waited at the bottom of the escalator we noticed that in that amount of time the board with carousel assignments was never corrected to the proper carousel. Our flights baggage was on #1, the board read 4 the entire evening.